When choosing an outdoor patio table one needs to consider the size, the shape and the material it is made of. 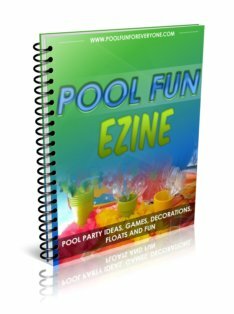 The style of the table should fit in with the feel and style of your house and pool area - whether it is traditional, modern, simple, or classic. Also take into consideration what kind of maintenance the outdoor tabletops will require. 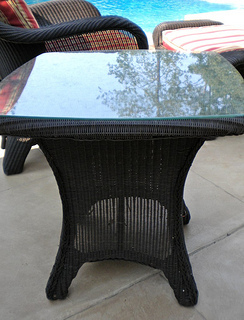 Glass table tops require much more care and maintenance than an open weave cast aluminum top. 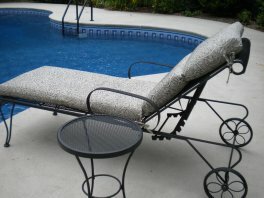 Do you plan to keep the outdoor furniture outside year round or protected in the winter with an outdoor furniture cover? 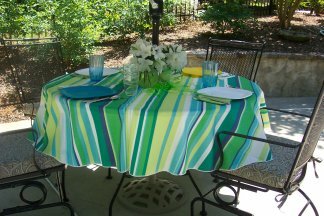 How will you use the outdoor dining table and typically how many will be seated at the table? Is it just for two of you or for a family of six? 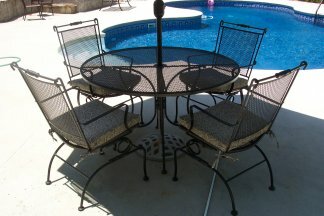 We started out with a round patio table that seated 4 people and have since added an oval patio table that now seats 6. What shape will look best in the space - oval, round, rectangular or square? The advantage of a round or oval table over a square or rectangular patio table is that it is possible to seat more guests. Just add more chairs and you can squeeze in an extra two people. No one wants to sit at the corner of a table. 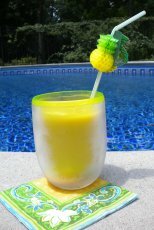 An aluminum patio table is a durable choice for an outdoor patio table. It can come in many different styles and finishes. The question most people have is should they invest in a high end patio set or a less expensive one from, let's say from Amazon, Target or Home Depot. That was our dilemma this summer when we were looking for new outdoor furniture. After reading many reviews, I found that some people even after spending high end dollars, still experienced some rusting, paint fading or flaking on their furniture. Others stated that after 5 years or so they wanted to change colors or styles and so they decided to go with lower priced outdoor dining sets. We purchased a cast aluminum patio table from Target. It has a powder coated frame that stands up to rust and years of wear and weather. Cast aluminum patio tables will need to be assembled once you get them home. The main difference between cast aluminum and cast iron, is that cast iron will rust after time, aluminum will not. This basket-weave design offers a timeless classic style. It is sturdy, heavy duty and just the right size to seat six people. Just clean it off with a hose or damp cloth. These types of outdoor tables come in different finishes whereas wrought iron furniture is available only in black. Ours is a traditional bronze finish as is this set from Amazon that includes 8 chairs as well as quality outdoor chair cushions. Without a doubt our favorite outdoor patio table is a wrought iron patio table. There is no constant wiping off of a glass table top. It always looks "clean" and it's always ready to use. I like the classic look of this outdoor dining table because it fits the look of our traditional, stucco house. The downside is that even though it is powder coated to protect from rusting, after several years rust does develop. However, I think it is the best value for your money. Outdoor end tables provide a spot to set down a drink, a magazine or a plate of food. What good is an outdoor chaise lounge or chair if there is no place to set down a cold drink or a snack? Often end tables will come as part of an outdoor seating set or you may have to purchase it yourself. Outdoor side tables come in many different shapes, sizes, colors and frames. Ideally the style or frame of the table should be the same as your other outdoor lounge furniture. If you have a white wicker chaise lounge, then the end table should also be white wicker. Here are some of the common materials used for patio end tables. These outdoor tables are rust resistant with a powder coated finish. This means it will rust after time - especially if you leave your outdoor furniture outside year round like we do. Some outdoor end tables are made from a rust-free aluminum frame, which means they shouldn't rust at all. 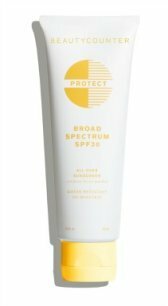 It offers a light weight powder coated finish for durability. An outdoor teak table will naturally age and turn colors - from a warm brown to a silver gray. Although protected by a heavy duty varnish for a durable finish it still will need to be revarnished periodically. Other styles that are available include folding patio tables, for easy storage, and nesting tables which come in sets of 2 or 3 and make great tables for outdoor parties. When purchasing a patio table top decide what kind of maintenance is involved. Glass tables require much more frequent cleaning than a wrought iron table top. Look for a shatter resistant tempered glass top. They offer unique designs with lots of variety of different stones for different looks. Thanks to all weather wicker, this patio end table doesn't need to stay on the porch any more. A wicker patio table offers a timeless and classic look. The new outdoor wicker is made of resin which makes it weather-resistant and can be easily cleaned by hosing it off. Be sure to ask if the wicker furniture is using an aluminum or a steel frame. A steel frame will rust and an aluminum one will not. Real wicker that is left in the sun will dry out, making the wicker brittle and prone to breaking. Moisture or water can warp the frame and after several years of exposure to water, the wicker will rot. Resin wicker is a synthetic material that can be formed into what looks like real wicker. This type of outdoor wicker can be left outside, and some manufacturers will state that it can be left outside year-round - just be sure it has an aluminum frame. The dye color is mixed right into the resin, so that there is no peeling or flaking of paint. A rust resistant finish will give you several years of use before signs of rusting appear.